Rapunzel is a character from the Disney movie called Tangled. 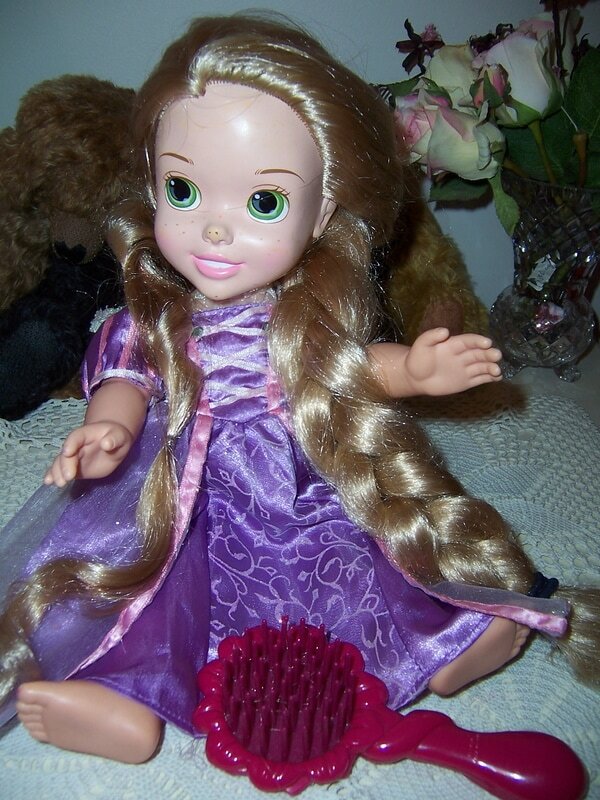 Our doll is called ''Magical Glow Rapunzel''. She is a battery operated doll, and when you brush her hair it is supposed to make her head glow under the hair and she is supposed to sing. She is not working. It may be an easy fix but she is being sold as is. She has is wearing her original purple dress, but has lost her shoes. 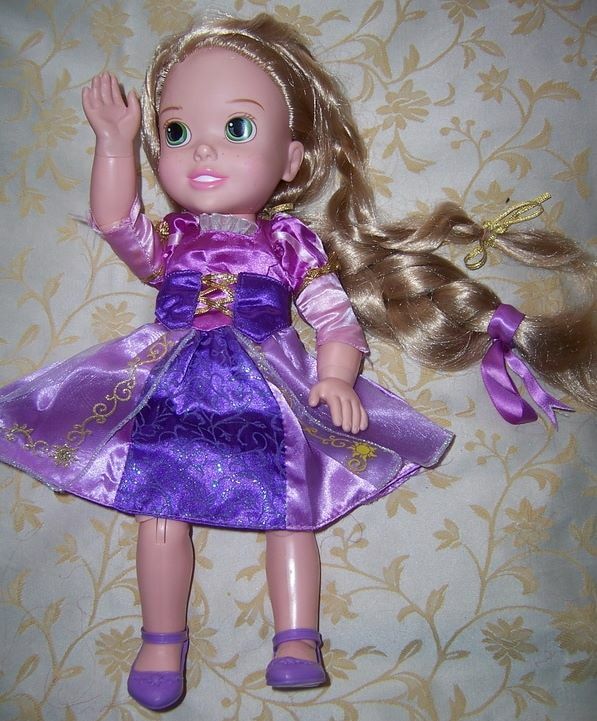 Rapunzel is an all vinyl jointed doll with wonderful large side glancing green eyes, freckles across her nose, and gorgeous super long blonde rooted hair. We have plaited it to show you how thick and long it is. It is super long and goes down to her toes. We have also given her a purple brush which suits her hair for brushing. 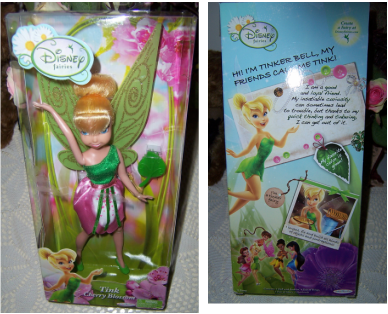 It is from another Disney friend character calledTinker Bell. My First Disney Toddler doll approx. 35cm tall - Rapunzel. She is wearing her original signature dress with purples sparkly pictures on the front. Rapunzel is an all vinyl jointed doll with wonderful large side glancing green reflection eyes, freckles across her nose, and gorgeous long blonde rooted hair. Her hair has been brushed and washed and tied with nylon pink ribbons. Her hair is down to her waist. She has lost her tiara and her shoes. 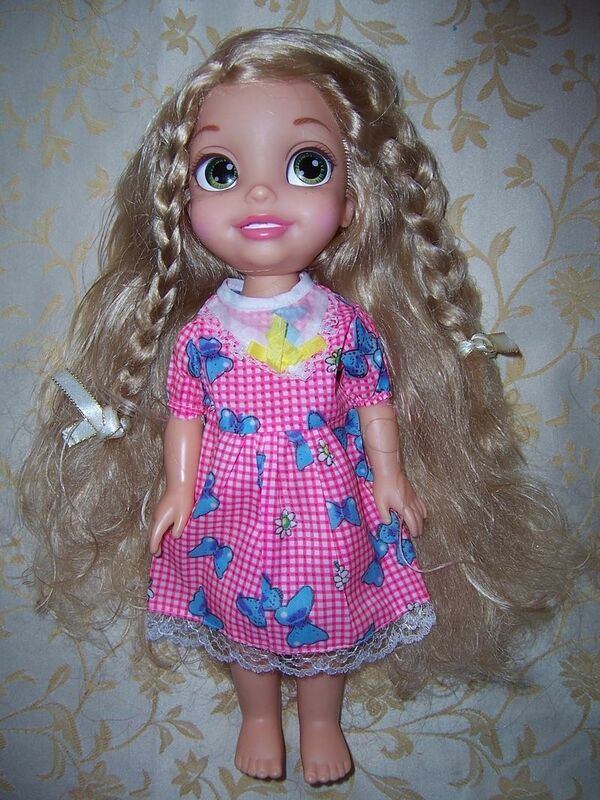 She is an all vinyl jointed (neck, arms, elbows, knees and legs) doll with wonderful large side glancing green eyes, freckles across her nose, and gorgeous super long blonde rooted hair. She is dressed in her original signature dress from the film and we have braided her hair and it can hang loose down her back to her shoes. She has lost her original tiara and has original mauve her shoes. We think she may have had a horse called Maximus at one stage but he is not with her. Her hair has been brushed and washed and hanging loose down her back almost to her feet. She has lost original dress, her tiara and her shoes. The dress she is wearing fits her perfectly. 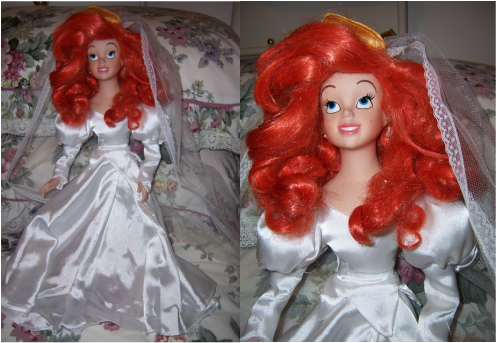 Ariel is all dressed for her wedding day. She is in her white satin wedding dress, long white pantaloons, and is wearing a golden crown fabric tiara with a long net wedding veil. She has "Disney" on her neck. She comes with no original box. Tinkerbell's outfit has been inspired by the bright and colourful spring flowers. Her is called "Cherry Blossom". There are 5 other different dolls and outfits to collect. 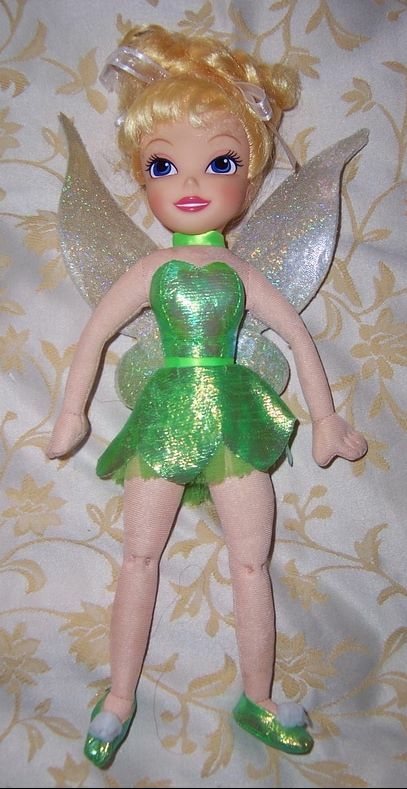 Tink is approx 22cm tall, has glitter wings, and a green leaf hairbrush for her blond rooted hair. She has never been removed from her box, although there may be light shelf wear to the box. Tinkerbell is a favourite for the young child. She is wearing her original green sparkly dress with matching green sparkly shoes, and large sparkly wings at the back - all of which cannot be removed. She is a very pretty fairy doll. Tinker Bell is all vinyl fashion type doll. She is jointed at the neck, breast, arms and legs. She is 25cm tall from the tip of her blonde hair to bottom of shoes. She comes in her original outfit which includes a green plastic tie around and her waist and matching green plastic shoes with long ties. Ariel - Disney movie "The Little Mermaid" is a very pretty doll who is similar to our Belle doll we are selling as well from "Beauty and the Beast" Disney movie. They have both been made by Playmates. She has painted open green eyes, and aqua and purple mermaid dress which has pearl adornments. Ariel is a character from the Disney movie called ''Little Mermaid''. Her very special original dress is decorated with a glittery scene from her fairytale adventures. She is also wearing her original blue slip on shoes (these are usually missing), and her glorious red hair has her original jewelled tiara in it. 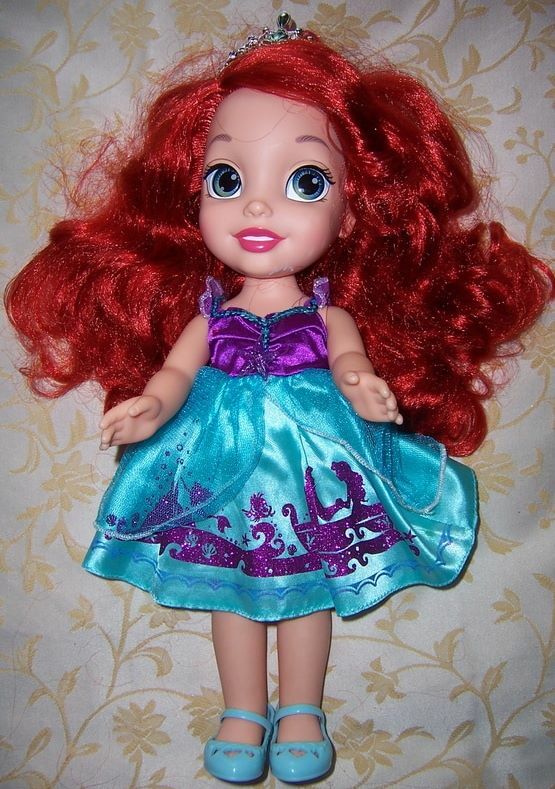 Ariel is an all vinyl jointed doll with wonderful large blue reflection eyes. 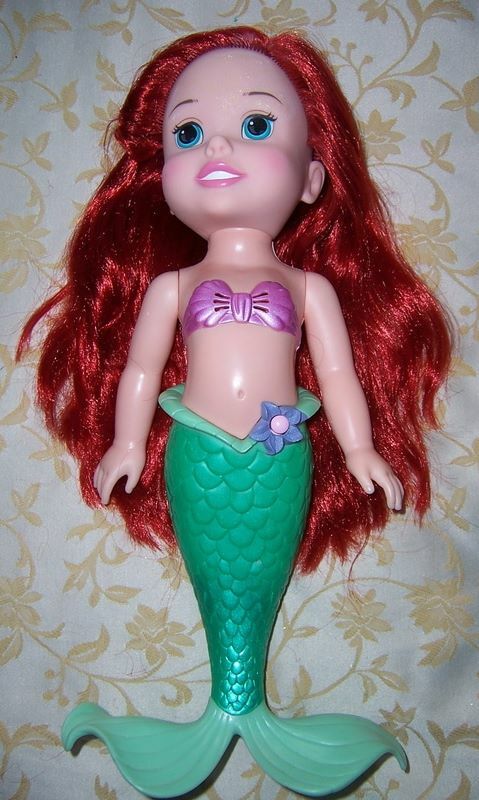 ""Singin in the bath Ariel"''is a battery operated doll but she is not working. She does not sing or hum anymore. She is still a lovely doll to take in the bath and wash and brush her glorious red hair. She has a vinyl head, vinyl arms and vinyl upper torso but her acqua mermaid tail is plastic. Her neck and arms are jointed and can be moved to different directions. There is a flower on top of her tail near her waist which has a button to press to make her sing. We have tested her with batteries and we cannot maker her to work, so she is being sold as is. She is approx. 36cm tall.